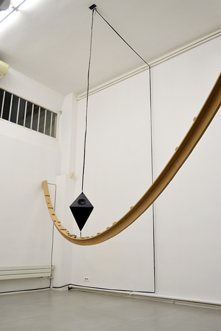 Hasard pendulaire # (pendulum random) is a series of sound and sculptural installations, made in harmony with the exhibition space. They are composed of a pendulum that oscillates above a spatial partition. Performative, these installations/ instruments are activated by a launcher, the interpreter who define the course of things with a simple unconscious gesture. Indeed, when thrown, the pendulum strikes, throughout its race, the sculpture thus producing specific rhythmics of acoustic sound corresponding to used materials. ￼In addition, these percussive sounds are captured and processed directly by a computer which generates, in the same listening space, an artificial second sound content. Tuning and detuning sounds with swings of the clock, these installations question the elasticity of the spacetime through a generative writing. They also interrogate the links between spatial and musical; between matter and sound. On an arbitrary and anecdotal action results in a unique visual and sound composition, with indefinite durations, that will play of the expectations of the viewer.